Bake at 350º until asparagus are tender but crisp, about 10-15 minutes depending. Another winner! Saved to del.icio.us! Could you do this with green asparagus? I've not seen the white around here too often? This looks great. 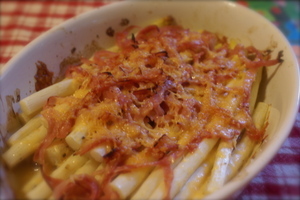 I have not had fresh white asparagus, but I love the green stuff, so I am sure I would love it! Delicious! Not very hard to make and tastes very nice. This really sounds yummy. I may try to make this. Your family is so fortunate to benefit from your good cooking. It is an inspriation for all families.